Grantsville, Md., March 7 - Mrs. Webster Crowe, 64, died Wednesday night at New Germany. A daughter of the late Peter and Mary Ellen Broadwater McIntyre, she was born in the rural section of Barton, Md. Mrs. Crowe, who resided in the New Germany community for many years, was a member of New Germany Methodist Church, whence the funeral will be held Sunday. Surviving are one son, Stanley Crowe, New Germany; two brothers, William McIntyre, Merrill and George McIntyre, who made his home with her and a sister Mrs. John Wiland, New Germany. Alice M. Crowe, 92, of Frostburg, passed away peacefully Friday, July 8 2016, at Western Maryland Regional Medical Center and went to be with her Lord two weeks after celebrating her 92nd birthday with her family. Born on June 24, 1924, in Eckhart, to John and Margaret (Brode) Wright, and except for a couple years lived in the same house her entire life. She is preceded in death by her parents; husband of 50 years, Milton N. Crowe; brothers, Raymond Wright and Joseph Wright; and sisters-in-law Ruby Wright, Ebbie Wright, and Bonnie Wright. Surviving is a son, James M. Crowe and wife, Karen, Havre de Grace; a daughter, Nancy Donius and husband, Gary, Severna Park; two loving grandchildren, Christopher Crowe and Ashley Crowe; a sister, Doris Hanna and husband, Tom, Dundalk; brothers, Harry Wright, Ridgeley, W.Va., and Ralph Wright, Eckhart; and numerous nieces and nephews. As far as her work, she started at the Celanese where she met Milton Crowe, after he returned from the war. He thought that she was the "prettiest girl he'd ever seen," and they married June 6, 1948. She also worked at Maurice's Department Store and was a longtime employee of G.C.Murphy's in Frostburg. Alice's other family were the members of the Eckhart Methodist Church, especially the Reverend George Harpold, and she was the oldest living member of the church. She was a member of the Helping Hands Society, always sang in the choir, and was involved in whatever church activities that were going on. She will be greatly missed. Family and friends will be received at Durst Funeral Home, 57 Frost Ave., Frostburg, on Sunday, July 10, 2016, from 2 to 4 and 6 to 8 p.m. Funeral services will be held at Durst Funeral Home on Monday, July 11, 2016, at 11 a.m. with the Reverend George Harpold officiating. Interment will follow in Eckhart Cemetery. Family requests in lieu of flowers, that monetary contributions be made in her name to the Eckhart Methodist Church, PO Box 444, Frostburg, MD 21532. Condolences to the family may be posted following the obituary on www.durstfuneralhome.com. FROSTBURG - Mrs. Anna Crowe, 66, a former resident, died yesterday at Multi-Medical Convalescent Home in Towson, where she had been a patient four weeks. Born in Finzel, she was a daughter of the late Adam and Hylie (Winebrenner) Eisler. Surviving are a daughter, Miss Delores Crowe, Baltimore; two sisters, Mrs. Nellie Caton, Cresaptown, and Mrs. Elsie Lotz, Frostburg; a half sister, Mrs. Bernette Klink, Oakland; two brothers, Samuel and Earl Eisler, Finzel; a half brother, Frank Howarth, Jennerstown, Pa.; three grandchildren and two great-grandchildren, and a number of nieces and nephews. The body will be at the Durst Funeral Home, where friends will be received today from 7 until 9 p.m. and tomorrow from 3 until 5 and 7 until 9 p.m. Services will be conducted Thursday at 1 p.m. at the funeral home with the Rev. Clarence A. Kaylor officiating. Interment will be in Frostburg Memorial Park. 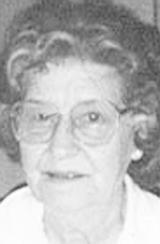 Mrs. Anna Louise Crowe, 88, of Amcelle Acres, Cresasptown, died yesterday at her home. Born in Finzel, she was a daughter of Jacob and Mary (Werner) Steinla and was the widow of George William Crowe. Surviving are a son, Eldon Crowe, Ridgeley; a daughter, Mrs. Violet Dorsey, Keyser; a sister, Mrs. Louella McKenzie, Finzel; two grandchildren and 7 great-grandchildren. The body is at the Scarpelli Funeral Home. FROSTBURG — Anna Margaret (Nelson) Crowe, 81, of Finzel, passed away Sunday, Jan. 13, 2013 at the WMHS Frostburg Nursing and Rehab Center. Born July 22, 1931 in Frostburg, she was the daughter of the late Andrew Nelson and Elvira (Hendley) Nelson. She was preceded in death by son-in-law Jim Deem. Anna was a member of the Emmanuel United Methodist Church. She is survived by her husband of 59 years, Hubert Crowe; sons, Andrew and wife, Joyce, Frostburg, James and wife Debi, Finzel; daughters, Elizabeth "Betsy" Deem, Finzel, Sharon Presley and husband Floyd, Eckhart, Julie Dzaack and husband Ken, Canaan Valley, W.Va., and Valerie Wilson and husband Kevin, Finzel; grandchildren, Donna (Crowe) Lucier and husband Nate, Stephen Crowe and wife Waleska, Jessica Crowe, Brian Crowe, Ashley Wilson, Megan(Dzaack) Bayonet and husband Chris, Michael Deem and wife Katie, Melissa Crowe and special friend Gerald Edmonds, Jason Wilson and fiancée Whitney Barker, Heather (Deem) Kossar and husband Tony, Amy (Dzaack)Curtis and husband Joe, Jon Deem, Erin Dzaack and fiancée Chase O'Dell, and Kimberly Crowe; great-grandchildren, Anna Lucier, Gabriel Crowe, Caedon Lucier, Carson Wilson, Emma Bayonet, Sophie Lucier; and sister Norma Fagan, Silver Spring. Also, numerous special nieces and nephews. Family and friends will be received at the Sowers Funeral Home on Tuesday from 2 to 4 and 7 to 9 p.m. Funeral service will be conducted at the funeral home on Wednesday, Jan. 16, 2013 at 11 a.m. with the Rev. Dan Agnew officiating. Interment will be in the family cemetery lot. Memorial contributions may be directed to the American Diabetes Association. There will be a time of fellowship and refreshments following the funeral at the Emmanuel United Methodist Church. FROSTBURG - Mrs. Anna V. Crowe, 81, of 158 McCulloh Street, wife of the late John D. Crowe, died Saturday night at Sacred Heart Hospital where she was admitted on May 8. She had been in failing health for four years. A native of Borden Mines, Mrs. Crowe was a daughter of the late John and Rose (Bartlom) Dean. She is survived by four daughters, Mrs. Joseph Connelley, Cumberland; Mrs. Hugh Nolan, Mrs. Ursula Dunn, and Mrs. Ezra Walker, all of Frostburg; two sons, J. Leroy Crowe and John F. Crowe, both of Frostburg; a sister, Mrs. Eleanor Fisher, Wiley Ford; 22 grandchildren and 32 great-grandchildren. She was a member of St. Michael's Catholic Church and the Sodality. The body is at the Durst Funeral Home where friends will be received today from 7 to 9 p. m. The rosary will be recited today at 8:30 p. m. in the funeral home. A requiem mass will be celebrated tomorrow at 9:30 a.m. at St. Michael's Church with interment in the parish cemetery. Active pallbearers, all grandsons, will be James Crowe, Hugh B. Nolan, Paul Nolan, Thomas Connelley, Robert Dunn and Robert A. Walker. Honorary pallbearers, also grandsons, James and Francis Connelley, Michael Walker, John Crowe and Timothy Crowe. KEYSER, W.Va. — Archie C. Crowe, 88, of Hershey Hollow Road, Keyser, died Wednesday, April 15, 2015, at his residence. Born on Oct. 12, 1926, at Finzel, he was a son of the late Roy Edward and Clara L. (Wolfe) Crowe. He also was preceded in death by a son, Larry M. Crowe and his wife Vicki; a granddaughter, Christina R. "Chrissy" Crowe; nine brothers, Raymond, C. Fred, J. Willard, Woodrow, Frank, Harold, Karl, Hubert and Delford Crowe and one sister, Hilda Sturtz. Mr. Crowe was retired as a salesman with Sell & Co. Wholesale Food Supply with 38 years of service. As a US Navy veteran of World War II, he was proud to have witnessed the raising of the United States Flag over Iwo Jima while stationed aboard the USS ElDorado. He was also a member of the Believer's Fellowship of the Word in Love, Keyser. Surviving are his wife of 68 years, Geraldine K. (Rawlings) Crowe; one son, Pastor Randy B. Crowe and wife Tammy of Keyser; two daughters, Shelba J. Reel and husband James of Keyser and Marsha Chambers and husband Mark of Romney, W.Va.; one sister, Ruth Stanton of Grantsville; seven grandchildren, Shellie Bachert and husband Michael, Sarah VanMeter and husband Brian, Micah Reel and wife Jillian, Valerie Chambers and partner Aaron Lennox, Daniel Chambers, Benjamin Chambers and Joshua Crowe and wife Daisy; ten great-grandchildren, Sabrina, Tiffany, Sean and Brittany VanMeter, Jonah and Claire Reel, Elliot Lennox, Caleb, Hainiah and Collin Crowe and two great-great grandchildren, Arabella VanMeter and Payton Dove. Friends may call at the Smith Funeral Home, Keyser Chapel, on Saturday, April 18, 2015, from 2 to 4 and 6 to 8 p.m. Funeral services will be conducted at the Smith Funeral Home, Keyser Chapel, on Sunday, April 19, 2015 at 2 p.m. with Pastor Randy Crowe and James Reel officiating. Interment will be in the Duling Cemetery, Keyser. The family requests that memorial contributions be directed to the Building Fund of the Believer's Fellowship, P.O. Box 446 Keyser, WV 26726. CUMBERLAND - Austen Dale Crowe, 16, of Cumberland, passed away Monday, Feb. 5, 2018. Born Nov. 11, 2001, Austen was the son of Jason Dale Crowe and Stefanie Lynn (Dunmeyer) Crowe, Cumberland. He was preceded in death by his maternal grandfather, Allan Dunmeyer; and his great maternal grandfather, Lester Bittner. Austen was a 10th grade student at Allegany High School. He had a compassionate heart and cared about others. He was perfection at every sport he tried including football, soccer, wrestling, basketball, track, and ASA. Our "Awesome" Austen played every sport full out and with great joy. He belonged to many community groups including 4-H, cub scouts, children's theatre, and YHEC with the Outdoor club. Besides his parents, Austen is survived by his maternal grandmother, Diane Dunmeyer, Kennels Mill, Pa.; his paternal grandmother, Joyce Johnson, Cumberland; his paternal grandparents, Jim and Vickie Crowe of Florida; his paternal step-grandfather, Charlie Johnson and wife, Mary Ann of Iowa. He also leaves behind his sister, Allyson Crowe, at home; his uncles and aunts, Shawn Dunmeyer, Les Dunmeyer, Kelly Gomer, Jille Crowe, John Crowe; his girlfriend, Emma Stafford; as well as numerous cousins. Friends will be received at the Adams Family Funeral Home, P.A., 404 Decatur St., Cumberland, (www.AdamsFamilyFuneralHome.com) on Friday, Feb. 9, 2018, from 2 to 4 and from 7 to 9 p.m. A funeral service will be conducted at the Tri-State Ministry Center, Hyndman, Pa., on Saturday, Feb. 10, 2018, at 11 a.m. with Pastor Bruce McBride and Pastor Steve Leydig officiating. The family will also receive friends one hour prior to the service. Interment will be in Comps Church Cemetery. The home of Silas Crowe, at a lonely spot on Savage Mountain, about five miles from here, was the scene of a mysterious shooting that is baffling the efforts of the coroner's jury endeavoring [where] to the place the blame for the death of Mr. Crowe's daughter, Bessie, aged 16 years. Tuesday afternoon about three o'clock the elder members of the Crowe family went away from home to return when summoned by neighbors and find the lifeless body of the child who has come to her death from the effects of a gunshot wound in the back of the head. The charge had entered just back of her left ear, tearing the back of her head off. There was no eye witness in the shooting, and the story told by a brother and a sister of the dead girl is doubted by the jury on the case. The brother, which is several years older than the dead girl, and a sister, several years younger, state that they were on the outside of the house and upon hearing a shot ran to find their sister with the gun in her hand lying on the floor. This story was at once disqualified by the jury impaneled, the Justice of the Peace, George Brown, acting coroner, when they had examined the body of the dead girl and failed to find any burns or powder marks. At a late hour Wednesday, no solution of the mystery had been reached. The brother and sister are both being held as witnesses. Barton, Md - May 10 - Mrs. Blanche Murphy Crowe, 74, Lonaconing, widow of Thornton J. Crowe, died yesterday afternoon at the home of her daughter, Mrs. Thomas J. Mowbray, at Barton. She suffered a paralytic stroke in January and since then has been in her daughter's home. She was a member of the Lonaconing Methodist Church. Besides her daughter she is survived by one son, Olin Crowe, New Kensington, Pa.; three step-children, William and James Crowe, Lonaconing, and Mrs. James Mclntosh, New Kensington, Pa.: three sisters, Mrs. Mary Hanlin, Westernport; Mrs. McClelland Fazenbaker, Swanton, Md., and Mrs. Robert Turnbull, Sr, Lonaconing, nine grandchildren and four great grandchildren. The body will remain at the home of her daughter at Barton. Mrs. Blanche Murphy, aged 74, Lonaconing, Md., widow of Thornton J. Crowe, died at the home of her daughter, Mrs. Thomas Mowbray, Jr, Barton, Sunday, May 9th. The body will remain at the Mowbray residence, where friends and relatives will be received and funeral services held Wednesday, 2:30 P. M. Rev. Lewis Ransom, pastor of the Methodist Church. Lonaconing, will officiate. Interment in Oak Hill Cemetery. Arrangements by Boal's Funeral Service. Cambridge Graham Crowe, 57 years of age, Dixie, W. Va., below this city, employe of the Ridgeley Orchard Co., died at Allegany Hospital Saturday night in being struck by the engine of Baltimore and Ohio Railraod train No. 1, at the Springdale street crossing. Mr. Crowe had walked upon the track directly in front of the locomotive, which was returning light in the shops. He evidently did not see or hear its approach. Engineer William Christopher endeavored to stop the locomotive when the fireman shouted to him, but it had struck Mr. Crowe and had run over him, crushing both legs and the left hand. Mr. Crowe was taken to Fulton street on the locomotive, and thence to Allegany Hospital where he was attended by Drs. William F. Twigg and Edwin Claybrook, who amputated the legs at the knees and the left hand. Mr. Crowe is survived by his widow, two brothers and two sisters, Walter Crowe, Long, Md. ; Winfield Crowe, Carlisle; Mrs. Carrie Jackson of Pekin, and Mrs. Susan Durst, of Meyersdale, Pa.
Funeral services for Cambridge Graham Crowe, 57 years of age, Dixie, W. Va., will take place tomorrow morning from Stein's mortuary chapel, with interment in Johnson cemetery. Mr. Crowe died Sunday night at Allegany Hospital from injuries sustained in being run over on the Baltimore and Ohio railroad tracks at Springdale street crossing. CUMBERLAND - Cecil A. Crowe, 78, of Bel Air, Cumberland, died Thursday, Aug. 19, 1993 at Sacred Heart Hospital. Born on June 12, 1915 in Barton; he was the son of the late George H. and Wilma (Broadwater) Crowe. He was also preceded in death by his wife, Marie Hager Crowe in January 1993. Besides his parents and wife, he was also preceded in death by one brother, Kenneth L. Crowe and one sister, Neva M. Monahan. Mr. Crowe was retired from the Celanese Fiber Corporation after 43 years of service in the spinning department. He was a member of the Highland Baptist Church. Surviving are two daughters, Rita Jeffries and husband, Carl, Shaft; Wilma Moon and husband, Jeff, Lisbon Falls, Maine; three step daughters, Colleen Hager and husband, Bob, Alexandria, Va.; Diane Warnick and husband, Phil, Keyser, W.Va.; Joan Hall and husband, John, Keyser; one step son, Patrick Hager and wife, Clara Ann, Pittsburgh, Pa.; two sisters, Pearl Kantor and husband, Joe, Olcala, Fla.; Frieda Bradley, Westernport; eight grandchildren; seven step grandchildren and nine great-grandchildren. Friends will be received at the Scarpelli Funeral Home, Cresaptown, on Friday from 2 to 4 p.m. and 7 to 9 p.m. Services will be conducted at the funeral home on Saturday at 1 p.m. with the Rev. Jack W. Lancaster officiating. Interment will be in Restlawn Memorial Park. A Mt. Savage native, residing in Amarillo, Texas, died March 5 after a two-car head-on collision on U. S. Route 81 near Decatur. Texas. Charles Crowe, 27, son of Mr. and Mrs. Alvin Crowe, Mt. Savage, died 15 hours after the accident, which occurred in the early morning hours when another car, going in the opposite direction, crossed a highway median strip and slammed into the car in which he was riding. The injuries which resulted in death were said by attaches at the Decatur Clinic to be severe head injuries and multiple lacerations. He had been employed as a salesman at the Duro Auction Company. 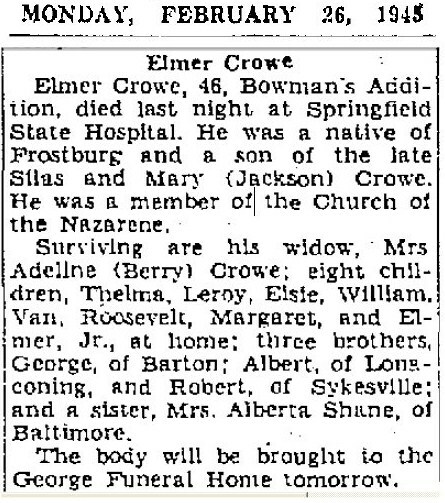 Surviving, in addition to his parents, are his widow, Mrs. Florine (Perry) Crowe; one son, Clifford Crowe, at home; four brothers, George L. Crowe, Baltimore; Clarence S. Crowe, Bell Vernon, Pa.; Edward Crowe, Cumberland; Ronald L. Crowe, Washington, D. C.; three sisters, Mrs. Edith Kitzmiller and Mrs. Geraldene Leonard, both of Mt. Savage, and Mrs. Madeline Smith, Cumberland. Services and interment took place in Amarillo. Frostburg - Charles Edward Crowe, 42, of 306 East Main Street, an electrician, died last night in University Hospital, Baltimore, where he had been a patient the past six weeks. A son of Mrs. Clara Crowe, Mt. Savage, and the late Charles Crowe, he is survived by his widow, Mrs,. Norvella (Loar) Crowe; two brothers, Furman Crowe and Wilbur Crowe, both of Mt. Savage; and four sisters, Mrs. Marietta Valentine, Cumberland; Mrs, Olivene Ting, Havre de Grace, Mrs,. Lillian Snyder, both of Mt. Savage. He was a member of Mt. Savage Methodist Church. Frostburg-Funeral services for Charles Edward Crowe, 42, husband of Mrs. Norvella Crowe, who died Monday night in University Hospital, Baltimore, will be held Friday at 2 p.m. from the home of his wife's parents, Mr. and Mrs. Burman(?) Loar; 308 East Main Street, by Rev. Walter D. Mehrling, pastor of Zion Evangelical and Reformed Church. Burial will be in Allegany Cemetery. FROSTBURG — Charles Walter Crowe, "Foxie," 66, died Friday, Aug. 11, 2006, at WMHS at the Sacred Heart Campus. Born May 10, 1940, in Frostburg, he was the son of the late Louis Crowe and Ruth (Boettner) Crowe. He was retired from the Kelly-Springfield Tire Company. He served in the United States Navy. He was a member of Eckhart United Methodist Church. Mr. Crowe was a member of Mt. Lodge 99 A.F.&A.M., the Scottish Rite, Ali Ghan Shrine and the Desert Legion Patrol. He was also a member of the Frostburg Moose 1273, American Legion Farrady Post 24 and the Cumberland Outdoor Club. Surviving are his wife, Marion (Davis) Crowe; two daughters, Rena Myers and husband William, Grantsville, and Cheryl Buck and husband Brian, Cumberland; and one granddaughter, Sarah Mae Myers. Friends will be received at the Sowers Funeral Home, P.A., 60 W. Main St., Frostburg, on Saturday from 2 to 4 and 7 to 9 p.m. Mt. Lodge 99 A.F.&A.M. will conduct a service along with the Ali Ghan Shrine Desert Legion on Saturday at 7 p.m. at the funeral home. Military rites will be accorded by American Legion Farrady Post 24. Funeral services will be conducted on Sunday at 2 p.m. at the funeral home with the Rev. George M. Harpold officiating. Interment will be in Sunset Memorial Park. Memorial contributions may be directed to the Frostburg Area Ambulance Service, Inc., 86 W. Main St., Frostburg, MD 21532. FINZEL - Mrs. Clara L. Crowe, 70, was dead on arrival yesterday at Memorial Hospital. She had been in failing health the past six months. Born in Finzel, she was a daughter of the late Claymore and Lucretia (Arnold) Wolfe. 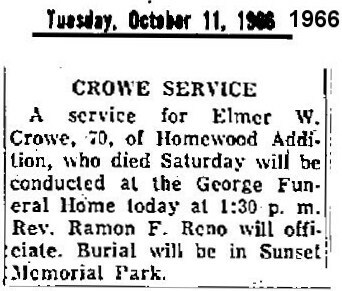 Her husband, Roy E. Crowe, died in 1960. She was a member of Johnstown Emmanuel Methodist Church. She is survived by two daughters, Mrs. Hilda Ellifritz, Cresaptown, and Mrs. Ruth Stanton, Grantsville; nine sons, Rev. Raymond Crowe, Glen Burnie; Rev. Frederick Crowe, Chateau, Mont., Rev. Karl Crowe, Martinsville, Va.; Archie Crowe, Keyser; Delford Crowe, Grantsville; and Willard, Frank, Harold, and Hubert Crowe, Finzel; one sister, Mrs. Pearl Crowe, Finzel; two brothers, Archie Wolfe, Finzel, and Charles Wolfe, Frostburg; 40 grandchildren and seven great-grandchildren. The body is at the Durst Funeral Home. The family requests that expressions of sympathy take the form of contributions to the Emmanuel Methodist Church Memorial Fund. FROSTBURG - Services for Mrs. Clara L. Crowe, 70, of Finzel, who died Wednesday, will be conducted tomorrow at 2:30 p.m at Johnson Church by .Rev. Emory McGraw. Burial will be in the church cemetery. The body is at the Durst Funeral Home and will be taken to the church at noon tomorrow. Pallbearers will be Grant Smith, Carl Line, Francis Winebrenner, Carl Ziegler, Albert McKenzie and Victor Twigg. 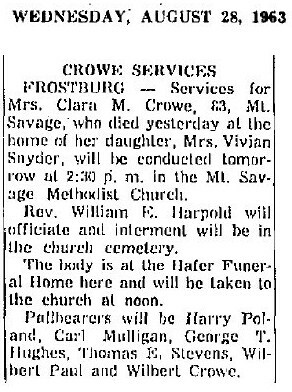 Frostburg - Services for Mrs. Clara M. Crowe 83, Mt. Savage, who died yesterday at the home of her daughter, Mrs. Vivian Snyder, will be conducted tomorrow at 2:30 p.m. in the Mt. Savage Methodist Church. Rev. William E. Harpold will officiate and interment will be in the church cemetery. The body is at the Hafer Funeral Home here and will be taken to the church at noon. Pallbearers will be Harry Poland, Carl Mulligan, George T. Hughes, Thomas E. Stevens, Wilbert Paul and Wilbert Crowe. 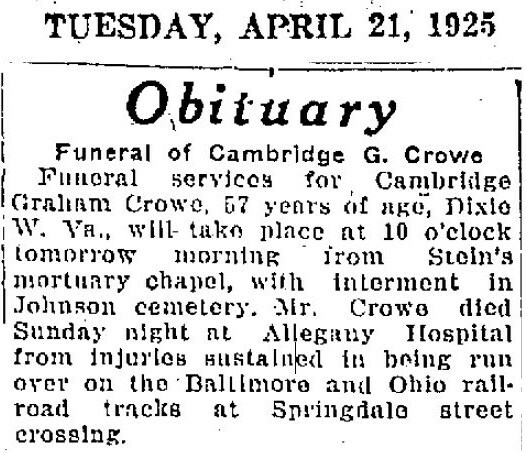 Clarence Edward Crowe was killed May 8 by a Baltimore & Ohio freight train at Broad Ford. FROSTBURG - Clifford E. Crowe, 63, Big Savage Mountain, was dead on arrival yesterday at Memorial Hospital. Mr. Crowe formerly owned and operated the Crowe Pontiac Company and at the time of his death was employed as a car salesman for Martin Chevrolet Company. Born in Finzel, he was a son of Mrs. Cora (Warner) Crowe and the late Elbridge Crowe. Besides his mother, he is survived by his wife, Leora (Johnson) Crowe; a daughter, Mrs. Wanda Andersen, Saratoga, Calif., and two grandchildren. He was a member of St. Paul's Lutheran Church and a past officer of the church council, a past president and zone chairman of the Lions Club, and a member and past trustee of BPO Elks Lodge 470. The body is at the Durst Funeral Home where friends will be received today from 7 until 9 p. m. and tomorrow from 2 until 4 and 7 until 9 p. m.
FROSTBURG — Mrs. Cora W. Crowe, 99, formerly of Frostburg, died yesterday in the Cumberland Nursing Home where she had been a patient three years. Born in Finzel, she was a daughter of the late Washington and Nancy (Engle) Warner. Mrs. Crowe was a member of St. Paul's Lutheran Church. Surviving are one granddaughter, Mrs. Wanda Anderson, Saratoga, Calif.; three great-granchildren and a number of nieces and nephews. Friends will be received at the Durst Funeral Home tomorrow from 2 to 4 and 7 to 9 p.m.
Curtis Victor Crowe, 65, of 222 Glenn Street, was found dead yesterday afternoon at his residence. The deputy medical examiner's office reported that Mr. Crowe died of asphyxiation attributed to methane gas poisoning. Three burners on a gas stove had been turned on. It was believed that he had been dead between three and four hours when found. 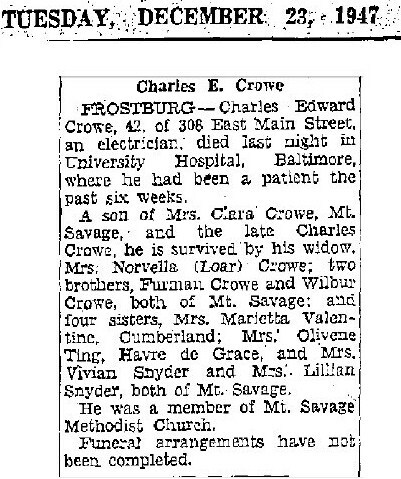 Born in Frostburg April 23, 1897, Mr. Crowe was a son of the late William J. and Mary (Offman) Crowe. An Army veteran of World War I, he was a member of Fort Cumberland Post 13, American Legion, and Cumberland Aerie 245, Fraternal Order of Eagles. Surviving are five sisters, Mrs. Ovella Walker, this city; Mrs. Katherine Poland, Westernport; Mrs. Martha Warehime and Mrs. Ora May Pollock, both of Baltimore, and Mrs. Marian Danner, Chicago, Ill.; and two brothers, Orville F. Crowe, Baltimore, and Zack R. (Bill) Crowe, Cleveland, Ohio. The body is at the Silcox Funeral Residence, where a service will be conducted at 1 p. m. tomorrow by Rev. John F. Sammel, pastor of St. Paul's Lutheran Church. Burial will take place at Sunset Memorial Park. Friends will be received at the funeral residence from 2 until 4 p. m. and 7 until 9 p.m. today. Members of Aerie 245 F. O. Eagles will conduct a service at the funeral home today at 8 p.m. Members of the Eagles will also serve as pallbearers. Grantsville, Md. - Jan. 28 - Funeral services for Daniel Webster Crowe, 75, farmer, were conducted this afternoon from New Germany Methodist Church, of which he was a member. Burial was in the church cemetery. 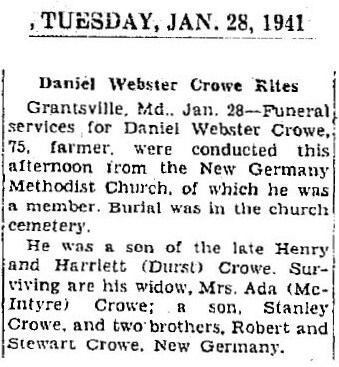 He was a son of the late Henry and Harriett (Durst) Crowe. Surviving are his widow, Mrs. Ada (McIntyre) Crowe; a son, Stanley Crowe, and two brothers, Robert and Stewart Crowe, New Germany. CUMBERLAND — Delford Theodore Crowe, 76, of Cumberland, died Tuesday at WMHS-Braddock Campus, Cumberland. Friends will be received at the Newman Funeral Homes, P.A., 179 Miller St., Grantsville, Thursday from 7 to 9 p.m. and Friday from 2 to 4 and 7 to 9 p.m. Services will be conducted in the Emmanuel United Methodist Church on Saturday at 11 a.m. Friends will be received one hour prior to services. CUMBERLAND — Services for Delford Theodore Crowe, 76, of Cumberland, will be conducted in Emmanuel United Methodist Church on Saturday at 11 a.m. with the Rev. Daniel Agnew officiating. Friends will be received one hour prior to services. Interment will be in the church cemetery. MOUNT SAVAGE — Delores Jean Crowe, 79, died Monday, June 27, 2011, at her residence. She was born Feb. 3, 1932, in Frostburg, to the late Urban Porter and Clarabell (Blubaugh) Porter. She was also preceded in death by her parents; nine sisters; one brother; and one randdaughter. Mrs. Crowe was a member of Mount Savage United Methodist Church. She retired as a head chef with the Marriott Corp. at Frostburg State University. Surviving are her husband of 63 years, Reaford L. Crowe; seven children, Donna Lashley and husband Elwood, Mount Savage, Sandra Scell and husband William, Albemarle, N.C., Barbara Baker and companion Lewis “Bub” Smith, Hyndman, Reaford Crowe Jr., Mount Savage, Tina Whetstone and husband Jeff, Frostburg, Pamela Hughes, Mount Savage, Bruce Crowe and wife Tiffany, Cresaptown; 26 grandchildren; 37 great-grandchildren; and four great-great-grandchildren. Also surviving are a brother, Urban Porter Jr. and wife Jeanne, Frostburg; and a sister, Crystal Minnick and husband Rich, Cumberland; and numerous nieces and nephews. Friends and family will be received at Durst Funeral Home, P.A., 57 Frost Ave., Frostburg, on Wednesday, June 29, 2011, from 2 to 4 and 7 to 9 p.m. Funeral services will be conducted at the funeral home on Thursday, June 30, 2011, at 10 a.m. with the Rev. George Harpold officiating. Interment will be in Mount Savage United Methodist Cemetery. Condolences may be sent to the family at durstfuneralhome.com. Donald Owen "Donnie" Crowe, age 67, of Avilton died suddenly Sunday, April 22, 2018, with his loving wife, Rita, by his side. Born Aug. 30, 1950, in Frostburg, he was the son of the late Ellis and Nora (McKenzie) Crowe. He was preceded in death by his older brother, Ellis Jr. "Sonny" Crowe. His sister by choice, Barbara Lee Hammonds, Clearville, Pa., died April 19. He leaves behind his anguished wife, Rita (Hummel) Crowe; his beloved daughter, Dana Lynn Wentlejewski and husband, Joe, Arnold. He was PopPop to his beautiful granddaughters, Alana Ogilvie and Drew Wentlejewski. He is also survived by his closest brother, Nevin Crowe, Avilton; two special nephews, Jeff Jenkins, Frostburg, and Tim Jenkins, Hagerstown; two sisters, Edna Mae McKenzie, Grantsville, and Juanita Stoyka, Ohio; and a brother, Kevin Crowe, Charles Town, W.Va., as well as numerous nieces and nephews and Crowe cousins. He has two aunts, Emma Mae Walker, local, and Betty Garlitz, Ohio; and two uncles, Glenn and Ronald Crowe, Ohio. Don retired as a regional manager for FPIS Inc. of Ocoee, Fla., in 2012, and had worked in management roles throughout the country for SCS Inc. Don hosted many family reunions and gatherings at Crowes Rest, where he was always the life of the party. At his request, his body has been cremated. Celebration of his splendid life is planned for a later date. Newman Funeral Homes, P.A., 179 Miller St., Grantsville, is in charge of cremation arrangements. Expressions of sympathy may be sent to his family at P.O. Box 275, Grantsville, MD 21536. Condolences may be sent to the family at www.newmanfuneralhomes.com. CUMBERLAND - Donald Raymond Crowe Sr., 70, of Cumberland, went to be with the Lord Sept. 19, 2006. Born on Jan. 15, 1936, in Cumberland, he was the son of the late Gurney Cleveland Crowe and Irene B. Crowe. He also was preceded in death by his loving wife, Jannette Louise (Sheesley) Crowe; infant son, James John Crowe; two brothers, Milton Crowe and Jack Crowe; and two sisters, Betty Crothers and Audrey Crowe. Donald graduated from Fort Hill High School, where he played football and ran track. He also served in the Marine Reserves for eight years. Donald was employed with the Kelly Springfield Tire Co. until he retired in 1981. He was a lifetime member of the Cumberland First Church of God. He also was an active member of the Cresaptown Eagles 2883 for 37 years. Surviving are three sons, Donald R. Crowe Jr. and wife Brenda, Dodgeville, Wis., Gurney C. Crowe and wife Eva, Uniontown, Pa., and Jerry Crowe and wife Jennifer; one daughter, Cheryl M. McCarty and husband Daryl of Cumberland; seven granddaughters, Terri Cassidy and husband Michael, Jannette McCarty, Stephanie Crowe, Emily Crowe, Allie Crowe, Raelynn Crowe and Ashlynn Crowe; one grandson, Donald R. Crowe III; one great-grandson, Grant Cassidy; and one brother, Lloyd Crowe. At Donald's request, his body will be donated to science research. Friends will be received for a memorial service at the Cumberland First Church of God, 2 Lagonda Ave., Saturday, Sept. 23, 2006, at 11 a.m. with the Rev. Samuel Seletyn officiating. In lieu of flowers, donations may be made in Donald's name to the Cumberland First Church of God, 2 Lagonda Ave., Cumberland, MD 21502. MOUNT SAVAGE — Doris B. Crowe, 90, formerly of Foundry Row, died Friday, Jan. 21, 1994, at Moran Manor Nursing Home in Westernport. Born June 3, 1903, in Mount Savage, she was the daughter of the late Samuel M. “Mack” Bowers and Margaret (Grahamn) Bowers. She was preceded in death by her husband, Joseph A. Crowe Jr, on Jan. 21, 1990. She was the last surviving member of her immediate family. Mrs. Crowe was a homemaker, and was a member of St. George’s Episcopal Church, Mount Savage. Surviving are several nieces and nephews. Friends will be received at the Durst Funeral Home, Frostburg, on Sunday. Services will be conducted on Monday at 11 a.m. at St. George’s Episcopal Church by Rev. Harold E. Bishop. Interment will be in St. George’s Cemetery. MOUNT SAVAGE — Dorothy "Dot" Crowe, 92, of Mount Savage, went to be with the Lord on Friday, Sept. 23, 2011, at Flaget Memorial Hospital in Bardstown, Ky. Born on Nov. 28, 1918, in Mount Savage, she was the daughter of the late Frank Aldridge and Elizabeth (Cook) Aldridge. She is preceded in death by her husband, Robert "Fay" Crowe; one son, Gerald David Crowe; sister, Naomi Murphy; brothers Ebbert, George and Thomas Aldridge. Mrs. Crowe resided at 12906 Brickyard Row NW in Mount Savage from 1938 until 2008 following her husband’s death in 1999. She was employed by McCrory Stores, Griffiths Apparel, and Triszells Beauty Salon of Frostburg. She was a life time member of Mount Savage United Methodist Church where she sang in the choir and taught Sunday school. Surviving are son, Robert Ferman Crowe Jr. and wife Linda of Washington County, Ky.; three grandsons Gregory and wife Ginny, Roderic and wife Anne, Damon and wife Courtney; four great-grandchildren, Spencer, Carolyn Joy, Carson and Presley Crowe; one sister Elizabeth Rose Weimer; and a number of nephews and nieces. Graveside memorial services and internment will be held at Mount Savage United Methodist Church Cemetery on Friday, Sept. 30, 2011 at 11 a.m. with the Rev. Max Greenfield and son Robert officiating. Arrangements are being handled by Sowers Funeral Home, Frostburg. Memorial contributions may be directed to Mt. Savage United Methodist Church. Condolences may be sent to the family at www.sowersfuneralhome.com. CUMBERLAND - Dorothy J. Crowe, 77, Oldtowne Manor Apartments, died Friday, Feb. 8, 1991, at Memorial Hospital. Born Sept. 18, 1913, in Cumberland, she was the daughter of the late John Robert and Mary Elizabeth (Howarth) Sharrett. She was preceded in death by her husband, Ellis “Babe” Crowe, in June 1959. A retired emplovee of the Allegany County Infirmary, Mrs. Crowe was a member of Centre Street United Methodist Church, United Methodist Women, Cumberland Women of the Moose, Cumberland Eagles Auxiliary, and South Cumberland Business and Civic Association. Survivors include three nephews, Louis J. Arnone, Robert H. Arnone and Robert S. Long, all of Cumberland; and three nieces, Mrs. Lillian Schriver and Mrs. Doris Franciosi, both of Cumberland; and Mrs. Jeanne Razek, Glen Burnie. Friends will be received at the Scarpelli Funeral Home, Virginia Avenue, on Saturday. The Women of the Moose will hold a memorial service at the funeral home Saturday at 8 p.m. Services will be conducted there Sunday at 2:30 p.m. by the Rev. Adam E. Grim. Interment will be in Sunset Memorial Park. A 10-year-old Chantilly, Va., boy, a former resident, died Sunday at Fairfax County (Va.) Hospital, of injuries he had sustained when he was struck by an automobile Friday afternoon. Douglas Raymond Crowe, of 13300 Lee-Jackson Highway, according to a representative of the family, was struck by a car when he and his brother Jack were crossing a highway near their home. The tragedy was the second in the family in five years. Douglas' father, Jack O. Crowe, was killed on July 1, 1960 while repairing an automobile tire in a Silver Spring service station. Douglas attended Floris Elementary School in Chantilly. Besides his brother, he is survived by his mother, Mrs. Ellen (Emerick) Crowe, a native of here; paternal grandmother, Mrs. Irene (Resh) Crowe, city, and maternal grandmother, Mrs. Marshal Emerick, Locust Grove. The body is at the Silcox Funeral Home where friends will be received from 2 to 4 and 7 to 9 p. m. A service wil be conducted there tomorrow at 1 p.m. by Rev. M.J. King, pastor of the Church of God. Interment will be in Restlawn Memorial Gardens. E. Stanley Crowe, 63, of 2004 Termon avenue, Pittsburgh, died suddenly in Allegheny General Hospital at 3.15 o'clock Wednesday afternoon. Born at New Castle - on - Tyne, England, January 8, 1882, he came to Connellsville in 1913 and worked for the John Curry Lumber Company. He was employed for a number of years as a tickat agent for the Pennsylvania Railroad. Afterward Mr. Crowe became associated with the Colonial National Bank and the Title and Trust Company. In 1932, he removed to Pittsburgh and became the secretary of the North Side Deposit Bank and at the time of death he held the position of vice-president in addition to being secretary. Mr. Crowe was a member of the Chamber of Commerce of Pittsburgh and the First Baptist Church of Connellsville. Surviving are his widow. Mrs. Geraldine Metzger Crowe, a brother, George W. Crowe of London, England, and a sister, Mrs. William McKeag of London. The body will be removed from the Frank W. Simons funeral home at 2025 Perrysville avenue, Pittsburgh, at noon Saturday, to the Brooks funeral home in East Green street, where services will be held at 2:30 P. M. Sunday with Rev. Hurry O. Kline officiating. Burial will take place in Hill Grove Cemetery. Crowe Funeral - A requiem high mass for Earl Crowe, 46, LaVale, who died Wednesday at Allegany Hospital, was celebrated yesterday in SS Peter and Paul Catholic Church by Rev. Louis Glantz, O.F.M. Cap., pastor. Burial was in the parish cemetery. Pallbearers were Ronald H. Proud, David Klosterman, Harry and Lloyd Michaels, Elmer Lashley and Edward Ellsworth. Seventeen months ago, Mr. Crowe was taken to Sinai Hospital in Baltimore to have a cancerous gullet removed and replace with a plastic tube. The operation was successful but cancer spread to other parts of his body. FROSTBURG — E. Woodrow Crowe, 41, formerly of here, died unexpectedly yesterday afternoon while working at Hess Brothers Packing Company, Waynesboro, Pa. Mr. Crowe, who had been residing at RD 2, Waynesboro, had been employed by the Hess firm since July. 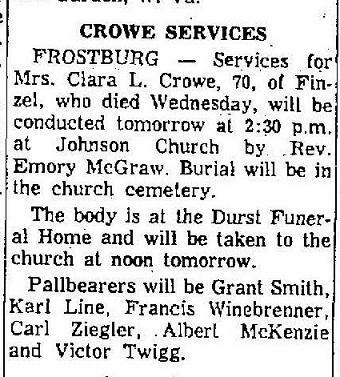 A native of near Frostburg, he was born December 17, 1918, a son of Clara L. (Wolfe) Crowe, of here, and the late Roy Edward Crowe. He was a member of Five Forks Brethren in Christ Church. He is survived, other than his mother, by his widow, Edna (Bittner) Crowe; five children, Mrs. Carolyn Heintzelman, Gettysburg, Pa., and Delbert, Robert, Jacky and Mark Crowe, all at home; nine brothers, Rev. Raymond Crowe, Baltimore; Rev. Steve F. Crowe, Kalispell, Mont., J. Willard, Frank, Harold and Hubert Crowe, all of Finzel, Rev. Karl Crowe, Martinsville, Va., Archie Crowe, Keyser, and Delford Crowe, Grantsville; two sisters, Mrs. Hilda Ellifritz, Cresaptown, and Mrs. Ruth Stanton, Grantsville; and one granddaughter. The body is at the Minnich Funeral Home, New Castle, Pa., where services will be conducted Saturday at 2:30 p.m. by Rev. Ralph Wenger. Interment will be in Antrim Church Cemetery. FROSTBURG - Mrs. Edith Crowe, 69, wife of Fred Crowe, 135 South Water Street, died early his morning in Miners Hospital where she had been a patient eight days. Mrs. Crowe was a daughter of the late William and Catherine (Roeder) Crump and held membership in First Presbyterian Church, Mountain Chapter 15 Order of Eastern Star, and Calanthe Temple 3, Pythian Sisters. 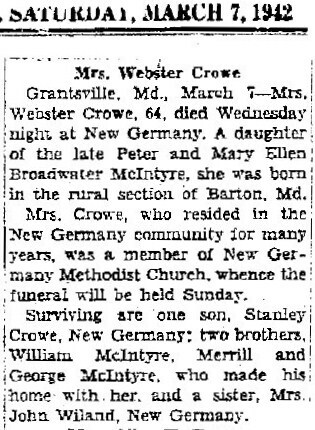 Surviving, besides her husband, are three sons, Kenneth Crowe, Frostburg; Ralph Crowe, Silver Spring, and Milton Crowe, Eckhart; two daughters, Mrs. Victor Rosso, Morgantown, W. Va., and Miss Catherine Crowe, at home; two brothers, Milton Crump, Luke, and Owen Crump, St. Petersburg, Fla., eight grandchildren and a great-grandchild. The body is at the Durst Funeral Home where services will be conducted Saturday at 2 p. m. by Rev. Paul Caravatta, pastor of First Presbyterian Church. Interment will be in Frostburg Memorial Park. Calanthe Temple 3, Pythian Sisters, will conduct a memorial service tomorrow at 7:30 p. m. at the funeral home. BERRYVILLE, Va. — Edward L. Crowe, 94, of Berryville, Va., died Friday, Jan. 18, 2013, at his home. Born May 26, 1918, in Avilton, he was the son of the late Edward Loar and Emma Catherine (Wilhelm) Crowe. He was preceded in death by his wartime bride, Velda Patricia (Davies) Crowe of Ebbw Vale, South Wales; two brothers, Ellis Charles and Gilbert Sylvester Crowe; and two sisters, Faye Genevieve Garlitz and Mary Elaine Engle. Mr. Crowe leaves behind two adoring children, Edwina Rae Crowe, Berryville and Graham Allen Crowe and wife Mary, Prattville, Ala.; five grandchildren, Christopher and Chad Crowe, Frankie Keedy and wife, GG, Trevor Keedy and wife, Jennifer, Alison (Keedy) Plummer and husband, Robert; six great-grandchildren, Christian and Addison Plummer, Aaron, Allie and Ami Cain and Amber Stubbs. Edward is also survived by his remaining brothers and sisters, Ida Morgan and Mable Horn, both of Baltimore; Betty Garlitz, Sheffield Lake, Ohio; Emma Walker, Frostburg; Glenn and Ronnie Crowe, both of Amherst, Ohio as well as numerous beloved nieces and nephews. Edward was a U.S. Army veteran of World War Two and served two tours of duty from March 1941 until November 1948 in the 160th Station Hospital Unit, 8th Airborne Division, as a medic and hazardous ambulance driver receiving the European, African, Middle Eastern Service Ribbon, a Good Conduct Medal, the American Service Ribbon, World War 2 Victory Ribbon and the European Campaign Medal. Ed or Eddie as he was known worked at the Celanese Plant near Cresaptown for 40 years. Ed helped to and supervised the production of cellulose acetate, fabrics and yarns for commercial and military applications. Ed was also a member of the AFL-CIO Local Union 1874, where he was instrumental in defending workers rights and was a leader in negotiating contracts for his fellow employees. Ed was appointed as a trial magistrate of Garrett County by Governor J. Millard Tawes for four two year terms. Mr. Crowe was the youngest trial magistrate in Maryland at the time. Ed was elected to a four year term on the Democratic State Central Committee. In keeping with his military background, Mr. Crowe was also active in the American Legion and the Veterans of Foreign Wars in Lonaconing, serving as commander of both organizations and for several years, assisting with returning veterans. Mr. Crowe also assisted the Lonaconing Ambulance Squad with calls when needed. The family will receive friends at the Newman Funeral Homes, P.A., 179 Miller St., Grantsville, on Tuesday, Jan. 22, from 2 to 4 p.m. A Catholic mass will take place at the St. Ann Mission Church, Avilton, on Wednesday, Jan. 23, 2013, at 11 a.m. (8043 Avilton-Lonaconing Road, Exit 24, Lower New Germany Road, drive 2 miles, the church is on the right). A luncheon will be held at the Avilton Community Center next to the church, following the mass. A private family interment will be held at a later date. Expressions of sympathy may be directed to the Wounded Warriors Project. AVILTON - Edward L. Crowe Sr., 102, died Friday at the home of his son, Edward L. Crowe Jr.[sic], with whom he resided. Born in Bloomington Oct. 3, 1882, he was the son of the late Mary Helen Crowe. Mr. Crowe was a retired coal miner and Garrett County road worker. He was a member of St. Ann's Catholic Church here. His wife, the former Emma Catherine Wilhelm, preceded him in death. Also surviving are four other sons, Ellis Crowe, here; Gilbert Crowe, Baltimore; Glen Crowe, Amherst, Ohio; Ronald Crowe, South Amherst, Ohio; six daughters, Mrs. Ida Morgan and Mrs. Mabel Horn, both of Baltimore; Mrs. Faye Garlitz, Lorain, Ohio; Mrs. Betty Garlitz, Sheffield, Ohio; Mrs. Mary Engle and Mrs. Emma Walker, both of Frostburg; 30 grandchildren, 38 great-grandchildren and one great-great-grandchild. Friends may call at the Newman Funeral Home, Grantsville, Saturday from 7 to 9 p.m. and Sunday 2 to 4 and 7 to 9 p.m. Mass of Christian burial will be celebrated at St. Ann's Church Monday at 10 a.m. by Father William Moody. Interment will be in the parish cemetery. The rosary will be recited at the funeral home Sunday at 7 p.m.
FROSTBURG - Elbridge Crowe, 80, of 143 West Main Street, Frostburg, died Monday at George Washington University Hospital, Washington, three hours after his sister died at Flintstone. His sister, Mrs. Della Sowers, 75, died at 10 p.m. Sunday at her home at R. D. 1, Flintstone, and Mr. Crowe died at 1:30 a.m., Monday. Mr. Crowe had been in failing health for two years and had been a patient at George Washington Hospital for 16 days. He was born February 13, 1881, in Garrett County, a son of the late Floyd and Margaret (McKenzie) Crowe. Mr. Crowe is survived by his widow, Cora (McKenzie) Crowe; a son, Clifford Crowe, of here; one grandchild; two sisters, Mrs. James Baker, also of here, and Mrs. George McKenzie, Flintstone. The body is at the Durst Funeral Home where the family will receive friends today from 2 to 4 and 7 to 9 p.m. Services will be held tomorrow at 2 p.m. at the funeral home with Rev. Harold Stoudt, of Baltimore, former pastor of St. Paul's Lutheran Church, here, officiating. Interment will be in Greenville Cemetery, Pocahontas. Richard Johnson. Paul Mowery, Fred McKenzie, Richard Hamill, Kendall Twigg and Patrick Purbaugh will be pallbearers. Cumberland (Bel Air) - Eldon H. “Bud” Crowe, 71 of (Bel Air), Cumberland died Thursday, December 26, 2002 in his residence. Born February 25, 1931 in Fairgo, MD he was the son of the late Eldon H. and Mabel (Avery) Crowe, Sr. Mr. Crowe was a member the Cresaptown United Methodist Church, the Cumberland Aircraft Model Society, and the Midnight Bowling League. He was retired from Kelly Springfield Tire and was a veteran of the US Army. He is survived by his wife of 51 years Freda J. (Stevanus) Crowe; two daughters, Victoria Border and husband Bob of Bowling Green, and Nancy Supinsky and husband Joe of Midland. Also surviving are three grandchildren: Brianne Border, Zackeray Border, and Megan Turner. Friends will be received at the Hafer Funeral Service, PA, Chapel of the Hills, 1302 National Hwy, LaVale on Sunday from 2-4 and 7-9 PM. Funeral services will be conducted in the funeral home chapel on Monday at 11:00 AM with the Rev. Harold R. McClay, Jr. officiating. Interment will follow in Sunset Memorial Park. Pallbearers will be Joe Supinsky, Mark Stevanus, Dave Border, Mike Border, Bob Border, and Zack Border. Memorials can be made in Mr. Crowe’s memory to the Cresaptown United Methodist Church, P.O. Box 5206, Cresaptown, MD 21505. The funeral of Miss Eleanor Bertha Crowe, whose remains arrived here from Fairmont, W. Va. last night, will take place from St. Michael's church tomorrow morning at 9 o'clock. Rev. Father Cuddy will sing the requiem mass. Interment will be made in the Porter cemetery. Miss Crowe and Miss Nellie Sypult were killed Saturday afternoon on a freight elevator in the box department of the Monongah Glass Company Fairmont. Miss Sypult was employed in the box department, Miss Crowe worked in the finishing department in another part of the plant and went to where Miss Sypult was to spend the noon hour. The elevator on which they were killed was used to hoist and lower freight, and was never used to carry passengers. The elevator, while rising slowly, caught the girls and squeezed them to death between the platform of the elevator and the floor of the factory. They were crushed through the back and chest. The squeeze was so tignt that the elevator had to be pried down to release the bodies. Coroner Lloyd was notified by Presiident R.L. Heintzelman and he went to the scene of the accident. The bodies were taken to the Cunningham morgue where they were prepared for burial. The girls in the factory had been warned not to go near the elevator and placards were posted, telling them to keep away. Miss Sypult was a daughter of Mrs. Jake Sypult. She leaves a mother and seven brothers and three sisters. She is the fifth in the family to meet an accidental death in four years. 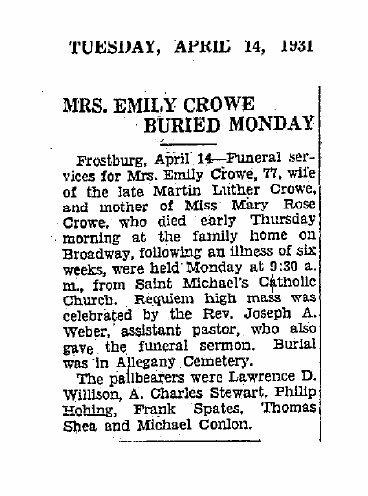 Miss Crowe's mother [Blanche McNulty Crowe] went to Fairmont from Frostburg some time ago. Frostburg, Jan. 2 - Mrs. Ellen (Warne) Crowe, 62, wife of Robert Crowe, Avilton, Garrett county, died yesterday morning at her home after a lingering illness. Besides her husband, she is survived by two daughters, Mrs. Charles Durst, Long Stretch, Garrett county and Mrs. Henry Michaels, Grantsville. She had five brothers, Salem and Jabez? Warne, Cleveland, Ohio; Charles, Grantsville; Wilford, Avilton and Stanley Warne, this city. Funeral services will be conducted from the Methodist Church at New Germany, Sunday. GRANTSVILLE - Ellis C. "Sonny" Crowe, 30, of Loartown, died suddenly Monday at his home. 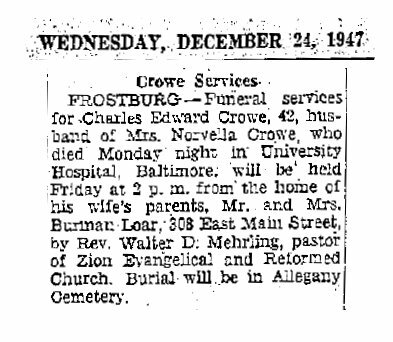 Born in Frostburg, he was a son of Ellis and Nora (McKenzie) Crowe, Sr., Avilton. He was a member of St. Ann's Catholic Church, Avilton. Also surviving are his widow, Lois (Ross) Crowe; one son, Jeffrey Crowe, at home; three brothers, Donald Crowe, Silver Spring; Nevin Crowe and Kevin Crowe, at home; two sisters, Mrs. Edna McKenzie, Avilton, and Mrs. Juanita Swauger, Grantsville. The body is at the Newman Funeral Home here where friends will be received today from 2 to 4 and 7 to 9 p.m. Requiem mass will be celebrated tomorrow at 10 a.m. at St. Ann's Church, with interment in the church cemetery. The rosary will be recited today at 7:30 p.m. at the funeral home. The family requests that expressions of sympathy take the form of contributions to the Heart Fund or the Allegany County League for Crippled Children. Ellis E. Crowe, 47, of Henderson Avenue, died yesterday in Sacred Heart Hospital. He had been in ill health since January. A native of Frostburg, he was a son of Mrs. Anna (Steinla) Crowe and the late George W. Crowe. Mr. Crowe was employed in the spinning department of the Amcelle plant of the Celanese Corporation. Surviving besides his mother are his widow, Mrs. Dorothy J. 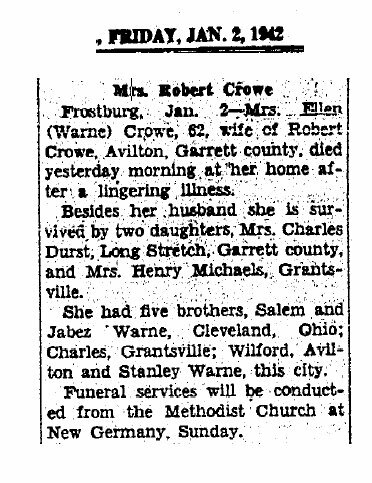 (Sharretts) Crowe; a brother, Eldon J. Crowe, Ridgeley; a sister, Mrs. Violet V. Dorsey, Keyser, W.Va. The body is at the Stein Funeral Home. Elmer Crowe, 48, Bowman's Addition, died last night at Springfield State Hospital. He was a native of Frostburg and a son of the late Silas and Mary (Jackson) Crowe. He was a member of the Church of the Nazarene. Surviving are his widow, Mrs. Adeline (Berry) Crowe; eight children, Thelma, Leroy, Elsie, William, Van, Roosevelt, Margaret, and Elmer, Jr., at home; three brothers, George, of Barton; Albert of Lonaconing, and Robert of Sykesville; and a sister, Mrs. Alberta Shane, of Baltimore. The body will be brought to the George Funeral Home tomorrow. Services will be held tomorrow at 2 p.m. at the George Funeral Home, corner of Greene and Smallwood streets, for Elmer Crowe, 46, Bowmans's Addition, who died Sunday night in Springfield State Hospital. The Rev. Harrison W. Diehl, pastor of the Church of the Nazarene will officiate, and interment will be in Zion Memorial Burial Park. The body was scheduled to be brought to the funeral home today. Elmer W. Crowe, 70, of Homewood Addition, died Saturday at Sacred Heart Hospital where he had been admitted September 23. Born in Mt. Savage, he was a son of the late Elmer R. and Ida M. (Crowe) Crowe. He was a former employee of Potomac Edison Company and was a member of Park Place Methodist Church. Surviving are his widow, Ethel B. (Witt) Crowe; a daugher, Mrs. Clara Iser, Rawlings; a son, George C. Crowe, LaVale; four half-brothers, Cecil Witt, Robert Witt, and James Witt, Mt. Savage, and Theodore Witt of Arizona; and a half-sister, Miss Dorothy Witt, city. The body is at the George Funeral Home where friends will be received today from 7 until 9 p.m. A service will be conducted there tomorrow at 1:30 p.m. Rev. Ramon F. Reno will officiate and burial will be in Sunset Memorial Park. Pallbearers will be Edgar Iser, Harry Iser, Quinton Gordon, Olin Moody, Jospeh J. Riley and James W. Rexrode. Source: The Cumberland Evening Times; Cumberland, Maryland; Oct. 10, 1966; page 7. LONACONING — Emil E. Crowe, 70, died yesterday at Sacred Heart Hospital, Cumberland. A native of here, he was a son of the late Ellsworth and Margaret (Teasdale) Crowe. He was a member of the Lonaconing Republican Club. Surviving are his widow, Ora (Nine) Crowe; a sister, Mrs. Margaret McCormick, here, and a brother, Paul Crowe, Bellaire, Ohio. The body is at the Eichhorn Funeral Home where friends will be received today from 7 to 9 p.m. and tomorrow from 2 to 4 and 7 to 9 p.m. Requiem mass will be celebrated Wednesday at 9:30. a. m in the funeral home. Interment will be in Oak Hill Cemetery. 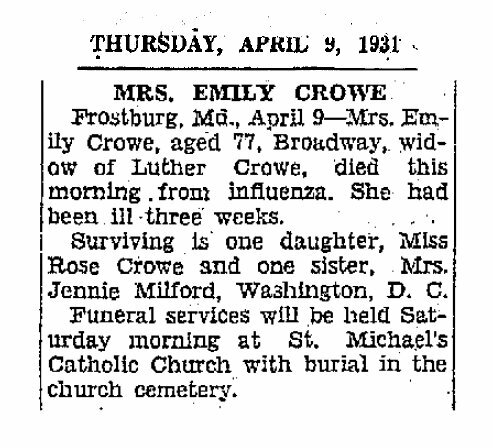 Frostburg, Md., April 9 - Mrs. Emily Crowe, aged 77, Broadway, widow of Luther Crowe, died this morning of influenza. She had been ill three weeks. Surviving is one daughter, Miss Rose Crowe and one sister, Mrs. Jennie Milford, Washington, D. C. Funeral services will be held Saturday morning at St. Michael's Catholic Church with burial in the church cemetery. Frostburg, April 14- Funeral services for Mrs. Emily Crowe, 77, wife of the late Martin Luther Crowe, and mother of Miss Mary Rose Crowe, who died early Thursday morning at the family home on Broadway, following an illness of six weeks, were held Monday, at 9:30 a.m. from Saint Michael's Catholic Church. Requiem high mass was celebrated by the Rev. Joseph A. Weber, assistant pastor, who also gave the funeral sermon. Burial was in Allegany Cemetery. The pallbearers were Lawrence D. Willison, A. Charles Stewart, Philip Hohing, Frank Spates, Thomas Shea and Michael Conlon. Grantsville, Oct. 8, Funeral services for Mrs. Emma Catherine Wilhelm Crowe, 45, wife or Edward Crowe, who died Friday at her home on Little Savage Mountain, near Avilton, will be held Monday morning at 10 o'clock from St. Ann's Catholic church with Rev. Father Hilary Lelhr?, pastor at Avilton, officiating. Interment will be In the Church Cemetery. Surviving besides her husband are her mother, Mrs. Ada Wllhelm, to whose home the body was taken; eleven children: Mrs. Paul Bugosh, Fay Crowe, of Frostburg; Eddie [Edward Leroy] of Lonaconing; Ellis, Gilbert, Glen, Mabel, Betty, Mary, Emma May and infant son [Ronald], all at home; 5 sisters: Mrs, Harry McKenzie. Grantsvllle; Mrs. Harry Russell, Barton; Mrs. Meta Anderson, Frostburrg; Mrs. Marshall Broadwater and Miss Elizabeth Wllhelm, Avilton; seven brothers: Francis and Harry Wllhelm, Lonoconing; Leonard, Julius, Asa, Thomas and Floyd Wllhelm, Avilton. 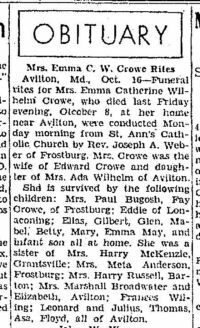 Avilton, Md., Oct 16 - Funeral rites for Mrs. Emma Catherine Wilhelm Crowe, who died last Friday evening, October 8, at her home near Avilton, were conducted Monday morning from St. Ann's Catholic Church by Rev. Joseph A. Weber of Frostburg. Mrs. Crowe was a wife of Edward Crowe and daughter of Mrs. Ada Wilhelm of Avilton. She is survived by the following children: Mrs. Paul Bugosh, Fay Crowe, of Frostburg; Eddie of Lonaconing; Elias, Gilbert, Glen, Mabel, Betty, Mary, Emma May, and infant son all at home. She was a sister of Mrs. Harry McKenzie, Grantsville; Mrs. Meta Anderson, Frostburg; Mrs. Harry Russell, Barton; Mrs. Marshall Broadwater and Elizabeth, Avilton; Frances Wiling; Leonard and Julius, Thomas, Asa, Floyd, all of Avilton. Mt. 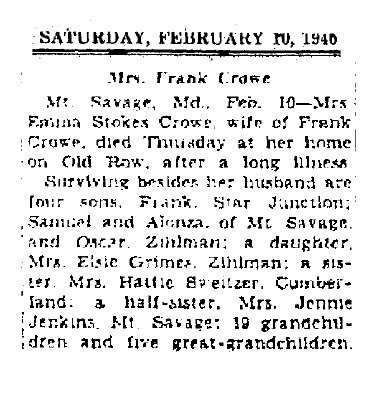 Savage, Md., Feb. 10 - Mrs. Emma Stokes Crowe, wife of Frank Crowe, died Thursday at her home on Old Row, after a long illness. Surviving besides her husband are four sons, Frank, Star Junction; Samuel and Alonza, of Mt. Savage, and Oscar, Zihlman; a daughter, Mrs. Elsie Grimes, Zihlman; a sister, Mrs. Hattie Sweitzer, Cumberland; a half-sister, Mrs. Jennie Jenkins, Mt. Savage; 19 granchildren and five great-grandchildren. 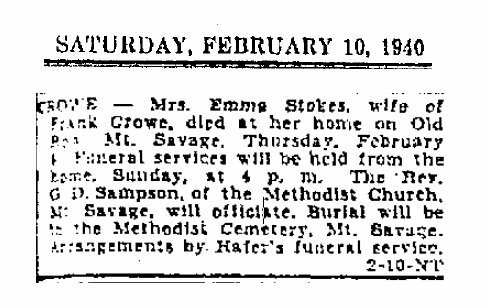 Mrs. Emma Stokes Crowe, wife of Frank Crowe, died at her home on Old Row, Mt. Savage, Thursday February 8. Funeral services will be held from the home Sunday, at 4 p.m. The Rev. G. D. Sampson, of the Methodist Church, Mt. Savage, will officiate. Burial will be in the Methodist Cemetery, Mt. Savage. Arrangements by Hafer's funeral service. Floyd Crowe, 77, died last night at his home on Hill Street, Frostburg, after an illness of six weeks. 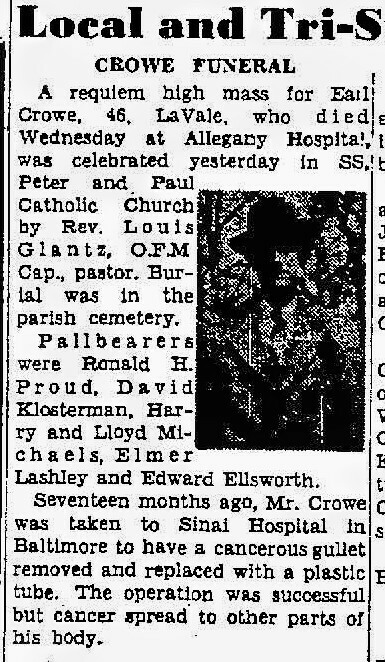 Prior to coming here 10 (could also be 16/side cut off from obituary) years to engage in the grocery business, he was a farmer in Garrett county, where he was born. He was a member of St. Michael's Catholic Church, Frostburg, from which the funeral will be held Friday morning at 9 o'clock, with burial in the church cemetery. Mr. Crowe is survived by three sons: Wilbur, Midland, Md. ; Francis and Eldridge, at home; and three daughters, Mrs. George McKenzie and Mrs. Della Weimer, Flintstone, Md., and Mrs. James Baker, Sand Patch, Pa.
MEYERSDALE - Eugene Ira Crowe, 89, died Monday. A native of Frostburg, he was a son of the late George and Louisa (Chaney) Crowe. 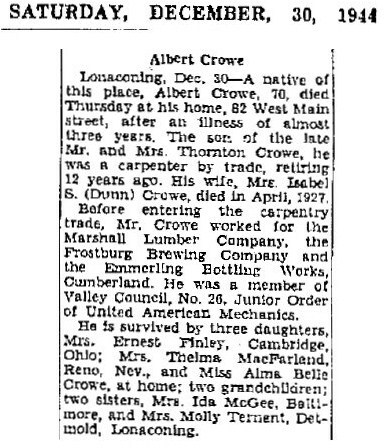 His wife, Addie (Baer) Crowe, died in 1950. Mr. Crowe was a former school teacher and bookkeeper and retired 20 years ago as an electrical contractor. He is survived by a son, A. Berny Crowe, here. The body is at the Price Funeral Home where friends will be received after 2 p.m. today. A service will be conducted there Thursday at 2 p.m. by Rev. Marcus Yobe. Interment will be in Union Cemetery. LAVALE - Evelyn "Peggy" L. Crowe, 76, of LaVale, died Monday, May 8, 2000, in the Allegany County Nursing Home. Born on Jan. 27, 1924, in Oldtown, she was the daughter of the late George Gilbert and Nora Joyce (Ryan) Swan. She was also preceded in death by four brothers, Richard B. Swan, Bruce G. Swan, Kenneth D. Swan, and Walter E. Swan. Mrs. Crowe was a member of the St. Patrick Catholic Church of Cumberland. She was a member of the Church Sodality, the Auxiliary of the Fraternal Order of Eagles #245 Cumberland, a lifetime member of the Ladies Auxiliary of the Cumberland Outdoor Club and a member of the Women of Moose Chapter #914 of Cumberland. Surviving are her husband of 54 years, Paul Elmer Crowe; a daughter, Waneta Lorraine (Crowe) Michaels, of Woodbridge, Va.; two grandchildren, Shanna Lee Michaels and Heather Lynn Michaels, both of Woodbridge, Va.; one great-grandson, Shawn Austin Michaels, also of Woodbridge; and two brothers, William E. Swan, of Valporaiso, Ind., and George G. Swan, of LaVale. There will be no visitation and her body will be cremated. A Memorial Mass will be celebrated at a time to be announced. Inurnment will be in St. Michael's Catholic Church Cemetery, Frostburg, at the convenience of the family. Memorial contributions may be made in memory of Evelyn Crowe to St. Patrick's Catholic Church Restoration Fund, Centre Street, Cumberland. Arrangements are under the direction of the Hafer Chapel of the Hills Mortuary, 1302 National Hwy., LaVale, Md.